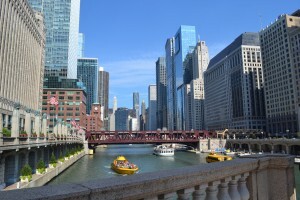 After exploring Cuyahoga Valley National Park, it was on to the big city: Chicago. Our friends Tristan and Sam invited us to stay with them for three nights, a generous offer that we couldn’t pass up. Heading west out of Cuyahoga took us through northern Ohio, where we stopped for a quick walk around Oberlin, and northern Indiana. It was a long day in the car, so unfortunately we didn’t have time for any extended stops aside from our picnic lunch. The scenery was pleasant, however, as we wove our way through small towns and farmland. Our first day in Chicago was a hot one, so we decided to make it a beach day. 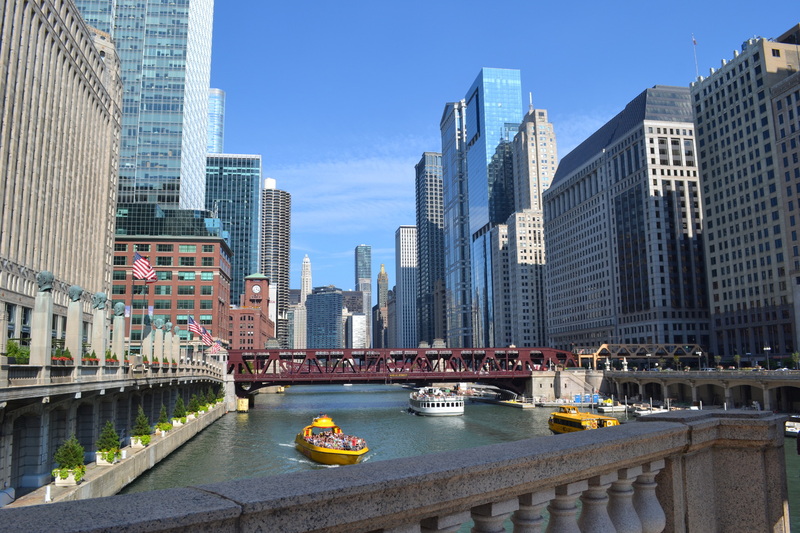 The waters of Lake Michigan were clear, pleasant and relatively easy to adjust to – a stark contrast from the frigid waters of the northern Atlantic. On a hot August day, cooling off in the lake was just what the doctor ordered. We followed it up with lunch at Billy Goat Tavern on Navy Pier (not the original location). Billy Goat Tavern, I came to learn, is famous for being associated with the curse of the Chicago cubs and a classic Saturday Night Live skit. The food is basic and on the greasy side – if you don’t want a hamburger or hot dog, there’s not much to choose from. After eating we made our way downtown where we spent the afternoon walking around and occasionally seeking refuge from the heat in air-conditioned stores and lobbies. The biggest treat of our trip was still to come: Tristan and Sam were taking us to Alinea, a fancy and famous Chicago restaurant, for a decadent dinner. It was a generous wedding present, and we were all looking forward to it. Alinea is not the kind of place you can frequent – it’s more of a “once in a lifetime” experience. The establishment has three Michelin stars and requires fancy dress and tickets paid for well in advance. Dining there is an experience, as the chefs manipulate food in incredibly creative and original ways and make a show out of the presentation. Our 11 courses took more than three hours to consume, and everything was executed flawlessly. Each course was presented beautifully and several appealed to numerous senses. One course, for example, evoked the colors, smells and tastes of Mexico and included the burning of scented wood chips at the table, which produced a fragrant smoke to complement the course. 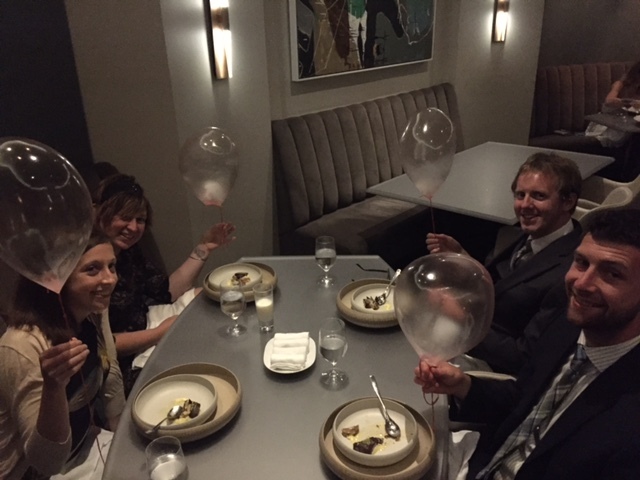 Another highlight was the strawberry helium balloons that came with dessert. Everyone loves a balloon, especially one you can eat! They did get sticky quickly, though, and I managed to get it all over my hand. I can’t have been the first, as the course also came with moist, hot towels for cleanup. All told, dining at Alinea was an incredible experience. Every course was interesting and fun, and the attention to detail and precise execution was astounding. It’s amazing to think about how the innovative courses were even concocted in the chef’s mind, let alone how the final products were created. It was certainly an experience my husband and I were thankful to have, yet another reminder of how truly lucky we are. I had so much fun reading this after breakfast! I miss you both! Thanks Lorelei! You can definitely come to our house – we want to see you too. And yes, please do bring the tea cup. Miss you guys! It’s been so much fun reading about your adventures. I hope we’ll be able to meet up at some point throughout your travels. Safe exploring! Thanks Los!!! I’m so glad you’ve been following along Looking forward to Tahoe!